Adams (1903) included this area in the Smoky Hills Upland division of the Great Plains physiographic province, and Schoewe (1949, fig. 22) classified it in the Smoky Hills and Blue Hills divisions of the Dissected High Plains. The area is characterized by gently rolling hills and undissected upland plains. The Greenhorn Limestone in southeastern Ellis County and the Fort Hays Limestone member of the Niobrara Chalk in southwestern Ellis County and southeastern Trego County form prominent escarpments, which rise 50 to 100 feet above the prominent terrace along Smoky Hill River. In southwestern Ellis County, long pediment slopes grade into the high terrace and mask the prominence of the Fort Hays escarpment. Smoky Hill River and its inner valley, entrenched 40 to 75 feet below the surface of the high terrace, are narrow inconspicuous features. The maximum local relief exceeds 100 feet in two general localities only: Near the Cedar Bluff dam in sec. 18 and 19, T. 14 S., R. 21 W., in eastern Trego County, where the escarpment of the Fort Hays Limestone member rises abruptly about 140 feet above the Hood plain of the river, and near Pfeifer where the bluff north of the river is formed by the Greenhorn Limestone. The total relief in the area is about 425 feet. The highest point is on the upland near the Cedar Bluff dam where the altitude is about 2,200 feet; the lowest point is along Smoky Hill River at the eastern side of Ellis County where the altitude is about 1,775 feet. One of the most prominent physiographic features along Smoky Hill Valley is the nearly un dissected high terrace, which ranges in width from 1 to 2 1/2 miles (Pl. 4B). This terrace was named the Pfeifer Terrace by Leonard and Berry (Frye and Leonard, 1952) for the town of that name built on its surface, The surface of the Pfeifer Terrace lies at an elevation of 25 to 60 feet above the level of the flood plain and 60 to 120 feet below the general level of the upland. The terrace has an upland appearance and, although geomorphologically related to the stream, is separated from the inner valley nearly everywhere by bedrock bluffs, The principal tributaries to Smoky Hill River have eroded deep valleys across the Pfeifer Terrace, but in general the terrace has a coarse-textured drainage pattern, and many small undrained depressions are scattered over its surface. Plate 4--A, Pleistocene channel cut in Cretaceous rocks and filled with deposits of Kansan age, north bluff of Smoky Hill River in SE sec. 28, NE sec. 33, and NW sec. 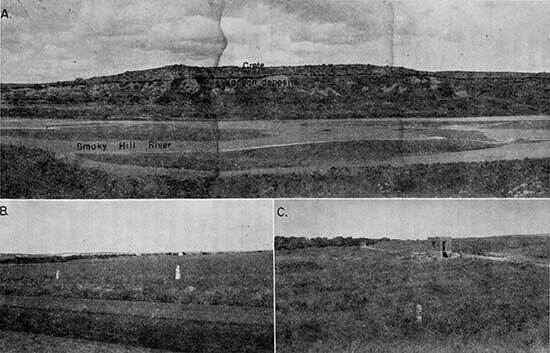 34, T. 14 S., R. 21 W., Trego County; B, Pfeifer Terrace, view looking northeast from Highway 183, east of Schoenchen; C, Scarp of Schoenchen Terrace and part of Hood plain of Smoky Hill River in SE sec. 28, T. 15 S., R. 18 W.
A prominent well-developed terrace extends along Big Creek especially on the north side. At Hays it is about 4 miles wide and extends on both sides of Big Creek. It attains a maximum width of about 7 miles in Ranges 16 and 17, where it extends from Big Creek to U. S. Highway 40 and beyond. This terrace is more rolling than the Pfeifer Terrace and its drainage pattern is better developed, although locally there are many small undrained depressions (Pl. 1). Loess is thicker and more widespread than on the Pfeifer Terrace, and the stream deposits underlying the loess probably represent several Pleistocene stages. Locally in southwestern Ellis County, pediment slopes, developed in the soft homogeneous Carlile Shale, descend from the escarpment of the Fort Hays Limestone member to the surface of the Pfeifer Terrace. They are smooth graded slopes that approximate perfect longitudinal stream profiles, and in places they are covered with a thin veneer of colluvium. The pediments blend into the terrace surface so imperceptibly that the upland edge of the terrace cannot be mapped precisely. In many places small streams, eroding headward, have cut gullies and dissected the pediments. The divide area between Big Creek and Smoky Hill River is typical of the upland plains of the Blue Hills. This area is gently rolling, moderately well drained, and mantled by a thin layer of loess and, locally, Pleistocene stream deposits of sand and gravel. The inner valleys of Smoky Hill River, Big Creek, and their principal tributaries consist of relatively narrow Hood plains bordered by low terraces that are 15 to 25 feet above the Hood plain and are as much as half a mile wide. In general, the terraces are gently sloping and moderately well drained. The discontinuous low terrace along Smoky Hill River is here named the Schoenchen Terrace for the village of Schoenchen, where the terrace is well developed (Pl. 4B). The low terrace along Big Creek is a more regular and continuous feature, but it has not been studied as much in detail as the Schoenchen Terrace. The climate of central Kansas generally is classed as subhumid and is characterized by abundant sunshine, moderate precipitation, and a high rate of evaporation. During the summer, the days are hot, wind velocity is moderate, humidity is low, and the nights generally are cool and comfortable. The winters generally are moderate, having only occasional short periods of severe cold. Average annual snowfall is about 20 inches, and the ground is covered with snow for an average of about 25 days each year. Trewartha (1941) described the subhumid prairie lands as having one to ten dry years (10 to 20 inches of precipitation) in twenty. Others ( Russell, 1932) regard the climatic zone between the humid east and the desert west as a typical steppe. When precipitation is normal, the boundary between the steppe and the humid regions is west of the area, but during dry seasons the steppe shifts eastward and includes the area. The following description of normal climate in this area is adapted from reports of the U. S. Weather Bureau. The mean annual temperature at Hays is 54.7° F. The hottest month is July, which has a mean temperature of 80.6° F; the coldest month is January, which has a mean temperature of 29.6° F. The average length of the growing season is 168 days; the average date of the last killing frost in the spring is April 29, and the average date of the first killing frost in the fall is October 16. The mean annual precipitation at Hays is 22.90 inches, of which 78 percent falls during the growing season, April to September. The largest precipitation generally falls during June (normal 4.27 inches) and the least in January (normal 0.46 inches). The annual precipitation was less than normal in 47 years in the 89-year period of record, and during 27 years was less than 20 inches. The smallest annual precipitation recorded was 9.21 inches in 1956; the greatest was 43.34 inches in 1951. The annual precipitation for the period of record and the cumulative departure from normal precipitation at Hays are shown in Figure 3. The graph for cumulative departure from the normal suggests that periods of abnormal precipitation may follow a cyclic pattern. Figure 3--Annual precipitation and cumulative departure from normal precipitation at Hays. As previously stated, the mean annual precipitation for Hays is 22.90 inches, but actual precipitation has been less than that amount during 47 of the 89 years of record. Hoyt (1936, p. 2) suggested that drought effects are serious when precipitation is less than 85 percent of the mean. Periods of deficient precipitation frequently are accompanied by low humidity, high temperatures, and strong winds that sear the land and crops. During 26 of the years since 1868, precipitation at Hays has been less than 85 percent of normal. During these drought years, the precipitation has averaged only 15.88 inches per year, or about 70 percent of normal. The three consecutive years of drought, 1893-95, was the most prolonged and severe drought period of record. During this period, the average annual precipitation was only 14.20 inches, about 62 percent of normal. Droughts of two consecutive years occurred in 1910-11, 1916-17, 1921-22, 1933-34, 1936-37. During the seven-year period 1933-39, precipitation was below normal each year, drought conditions occurred during five years of the period, and the seven-year average annual precipitation was only 17.99 inches, 78 percent of normal. During the period 1952-56 precipitation was below normal, and the annual precipitation in 1956 was only 9.21 inches, the lowest during the period of record. The average annual precipitation during this five-year period was 16.68 inches. In general, however, periods of drought are balanced by periods of excessive precipitation; the 1893-95 drought was followed by three years during which the average precipitation was 28.66 inches, and the drought of the 1930's was followed by an eleven-year generally wet period, 1941-51, during which the average precipitation was 26.53 inches. During the 20-year period 1932-51, six drought years and eleven years of subnormal precipitation were recorded at Hays, yet the average precipitation for the period was 23.41 inches, 0.51 inch above normal. According to the 1950 census, Ellis County had a population of 19,043, a rural population of 7,769, and a rural-population density of about 9 persons per square mile. The area studied during this investigation has a population of about 3,000, of which 170 live in Schoenchen and the others in the rural areas and in the unincorporated towns of Antonino, Munjor, and Pfeifer. The northeastern part of this area is served by the main line of the Union Pacific Railroad, which passes through Victoria and Hays. U. S. Highway 40 parallels the Union Pacific Railroad, and U. S. Highway 183 traverses the center of the area in a north-south direction through Hays and half a mile east of Schoenchen (Pl. 1). Connecting with the main highways is a good system of hard-surfaced and graded county roads. Agriculture is the chief occupation in the area. Wheat is the principal crop and is grown on more than half the area cultivated each year. Other crops are sorghums, grown for both grain and forage, and alfalfa. In general, sorghum and alfalfa are grown on the low terraces and flood plains along the principal streams where the water table is relatively near the surface. Less than 10 percent of the area shown on Plate 1 is pasture land; the larger pastures are along the escarpments of the Greenhorn Limestone and Fort Hays Limestone member and in the southwestern part of Ellis County south of Smoky Hill River. Mineral resources, other than ground water, produced in this area are oil, limestone, sand and gravel, silt and clay, and volcanic ash. In central Kansas oil was first discovered in the Fairport Pool in northwestern Russell County in 1923 (Rubey and Bass, 1925, p. 13). In 1928 oil was discovered in Ellis County in the Shutts Pool (combined with Bemis to form Bemis-Shutts Pool in 1939) in T. 12 S., R. 17 W. (Ver Wiebe, 1938, p. 37-44; 1940, p. 24). Oil was first produced in the Smoky Hill Valley from the Ruder Pool, discovered in 1935. Production figures, wells drilled, and the history of development of the pools are given in the oil and gas reports of the State Geological Survey. Figure 4 shows the locations of producing oil fields in this area. Figure 4--Locations of oil pools in the area. Abandoned fields are not shown. More than a score of quarries have been opened in the "Fencepost" Limestone bed of the Greenhorn Limestone in southeastern Ellis County (Pl. 1). Commonly, the quarries are 20 to 50 feet wide and follow the limestone outcrop along the contour of hills. Most of these quarries have supplied stone for both building stone and fence posts. Along the escarpments near Big Creek and Smoky Hill River, the "Fencepost" Limestone bed lies beneath a few feet of shale that is removed easily. The "Fencepost" bed, which is persistently 8 to 10 inches thick, is quarried for fence posts in blocks about 1 foot wide and 5 1/2 to 6 feet long. On fresh exposures the limestone is chalky and can be sawed, cut with a knife, or penetrated with an ordinary drill. In hand quarries the limestone generally is wedged off after a series of holes have been drilled through it. Other holes, or notches, are drilled in the stone posts in order to fasten the wire to them. Stone posts are not quarried extensively at the present time, but in southeastern Ellis County thousands of them are still in use, and some farmsteads have few posts of any other kind. In 1897, Logan (p. 217) estimated that 50,000 stone posts were in use in Mitchell and Lincoln Counties, and stated that 5,000 were used in one township. In southeastern Ellis County it is estimated that 20,000 posts are used in a single township. In addition to fence posts, the limestone has been used widely in southern Ellis County and elsewhere for foundations and buildings. Among the buildings constructed from this stone are the magnificent Catholic churches at Pfeifer, Victoria, and Liebenthal and the principal buildings at the Fort Hays State College in Hays. Newer buildings constructed from sawed blocks of this stone include the Methodist church and the Ellis County courthouse in Hays. Rock quarried from the "Fencepost" Limestone bed has been used also for flagstone and crushed aggregate or road material. Elsewhere the limestones and intervening shales of the Greenhorn Limestone have been crushed and mixed and the material applied to county highways. Under moderate traffic the mixture becomes bonded into a serviceable all-weather road. The Fort Hays Limestone member of the Niobrara Chalk also has been quarried for structural stone, although it is not as weatherresistant as the "Fencepost" Limestone bed. It is softer than the Greenhorn Limestone and spalls badly when used for foundation stone. Stone from the Fort Hays has also been crushed for road material, has been used in the manufacture of putty and Portland cement, and is suitable for agricultural lime, chalk, and the manufacture of lime. Gravel has been quarried in many localities for use as concrete aggregate, road material, and macadam. The quality of the sand and gravel has been discussed in detail by Byrne, Coombs, and Bearman (1947, 1949). The sand and gravel that is quarried most widely is from the Crete Formation, which forms the prominent high terrace along Smoky Hill River. Many pits, some very large, have been opened in this material. In general, the Crete Formation consists predominantly of fragments of quartz, granite, and dark igneous rocks; it contains a smaller amount of acid-feldspar and limestone fragments. The material is coarse, containing, in its lower part, many pebbles as much as 2 inches in diameter, and it contains very little silt and clay. Iron staining from a small content of limonite is common. The most extensive quarries are on the Mike Unrein and N. R. Werth farms in the SE sec. 16, T. 15 S., R. 19 W., and the NE sec. 29, T. 15 S., R. 18 W., respectively. More than 60,000 cubic yards of gravel is reported to have been quarried from the Unrein farm. In addition to quarries in the Crete Formation along Smoky Hill River, several small quarries for gravel have been developed in the Nebraskan(?) deposits near Antonino and Victoria. In general, gravel from these deposits contains a much larger percentage of limestone pebbles and disseminated limy material than gravel from the Crete Formation. Silt and clay for ceramic raw material, binder material, and fill for earthen dams are available from the Carlile Shale where it is weathered, from the wind-deposited silts of the Upper Pleistocene Subseries in the upland, and from the younger Pleistocene alluvial deposits. Plummer and Hladik (1948, p. 82, 86) have tested the Blue Hill Shale member of the Carlile Shale and report that it is suitable for the manufacture of light-weight aggregate. Silt from the alluvial deposits underlying the Schoenchen Terrace surface was the principal material used in construction of the earth-fill Cedar Bluff dam. Volcanic ash has been used as a constituent of ceramic glazes, of impervious concrete, and as mineral filler for bituminous-surfaced highways. A small pit has been opened in the volcanic ash in the Sappa Formation in the SW sec. 36, T. 14 S., R. 21 W. Because the ash deposit is small, it has little commercial value. The rocks that crop out in the area are sedimentary and range in age from Early(?) Cretaceous to Recent. A generalized section of the geologic formations and their water-bearing properties is given in Table 1; the areal distribution of the geologic formations is shown on Plate 1, and their stratigraphic relations are shown on Plate 3. Table 1--Generalized section of outcropping geologic formations in southern Ellis County and parts of Trego and Rush Counties. Classification of State Geological Survey of Kansas. deposits 0-65 Silt, sandy silt, sand, and gravel, interbedded and stratified. Includes deposits underlying Schoenchen Terrace. Yield abundant supplies of water along Smoky Hill River, large supplies along Big Creek, and moderate amounts along tributary streams. Formations 0-40 Upper part silt and clay, yellow; lower part well-sorted stratified sand and gravel (Crete Formation). Yield moderate supplies of water for domestic and stock use except where thin and above the water table. Formations 0-55 ± Silt, clay, volcanic ash, sand, and gravel; fills narrow bedrock channel along Smoky Hill River and underlies part of high terrace of Big Creek. Yield moderate amounts of water for domestic and stock use to a few wells in the area. Nebraskan(?) deposits Unconformable on older deposits 0-25 Silt, yellow buff, and fine to coarse sand and gravel, occurring in a few areas. Yield moderate supplies of water in Antonino area, in vicinity of Victoria, and in some places on eastern Ellis County. Elsewhere above water table. Pliocene Ogallala Formation 0-5 ± Sand, gravel, silt, and clay cemented with calcium carbonate. Yields no water to wells. Chalk 0-40 Upper chalky shale member removed by erosion in this area. Lower part consists of massive soft white limestone interbedded with paper-thin gray shale. Forms prominent escarpment. Yields little or no water to wells. Shale 300 Shale, blue gray, noncalcareous, containing calcareous septarian concretions in upper part. Lower 100 feet is calcareous blue-gray to buff shale; contains thin concretionary chalky limestone and thin bentonite seams Yields little or no water to wells. Limestone 100 Shale, calcareous, blue gray, interbedded with thin chalky fossiliferous limestone; contains thin persistent seams of bentonite. Weathered and fractured limestone yields meager supplies of water to a few wells in eastern Ellis County. Shale 40 ± Shale, noncalcareous, blue black to brownish black. Contains selenite crystals, pyrite, thin coquina-like limestone and local sandstone lentils. Yields little or no water to wells. Formation 150-300 Clay, shale, siltstone, and sandstone, interbedded, lenticular, and varicolored. Contains lignite locally in upper part. Sandstone lentils yield supplies of water having a wide range in quality and generally under artesian bead (for domestic and stock use). Where formation is deeply buried, water may contain excessive chloride. The oldest rocks exposed in the report area are the sandstones of the Dakota Formation of Early(?) Cretaceous age. Overlying the Dakota is a series of marine rocks of Late Cretaceous age, classified in ascending order as the Graneros Shale, Greenhorn Limestone, Carlile Shale, and Niobrara Chalk. In the western part of the area, the divides north and south of Smoky Hill Valley are capped with remnants of the Ogallala Formation, of Neogene age. Unconsolidated sediments, representing each stage of the Pleistocene, overlap and fill channels cut into the Cretaceous bedrock. These deposits are predominantly stream-deposited sand, gravel, and silt and are classified as deposits of Nebraskan (?) age, deposits of the Grand Island and Sappa Formations of Kansan and Yarmouthian age, the Crete and Loveland Formations of Illinoisan and Sangamonian age, terrace deposits and Peoria Formation (Fig. 6) of Wisconsinan age, and alluvium of Recent age. In most of the area the Pleistocene rocks are the principal sources of ground water. Placed on web Feb. 4, 2013; originally published March 1961.